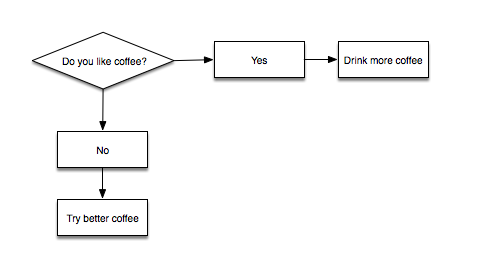 How to go from sketching boxes to producing clear and consistently readable flowcharts, in under 500 words. 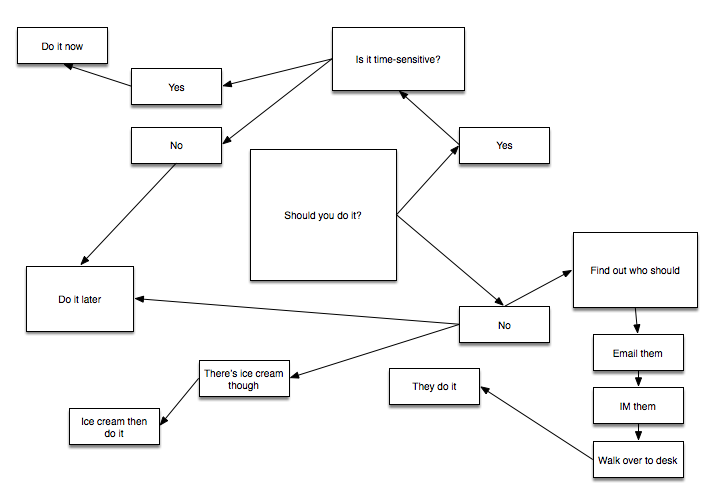 It started a discussion on learning the most basic guidelines for making a good flowchart. I volunteered to write this and share it now in the hopes it’ll help future generations. Using these will help not only make flowcharts more readable, by being consistent you’ll more easily find errors and things that are unclear in the flow you’re documenting. Cultural note: this assumes you’re in a language/culture that reads left to right, top to bottom. Adjust as you see fit. Reduce effort by flowing as your audience reads: left to right and then down. The chart as a whole all the way down to each object: arrows come in from the left and exit from top/bottom/right. If you can’t do left-right for the chart (or an object’s connection), top to bottom’s 2nd-best. Yes/No or True/False should go in the same direction each time they’re on the chart. Anything else creates confusion and possibly someone making the wrong choice. Generally, I’ve found that the positive (“Yes”/”True”) is most easily read if they’re the up in up/down and right in left/right, but as long as you’re consistent it’ll be okay. Attempt wherever you can to keep the boxes a consistent size, unless the difference in sizing carries meaning. Keep the amount of space between symbols as consistent as you can. If you can, line up things of the same type, like decisions and conclusions, especially if they share something (for instance, they happen at the same time). Use them, they help immensely. Two ways to do this. If possible, put the labels right next to the decision — don’t make people search for what the decision is. They should at the decision point know the answer to the question and be able to immediately know which line to follow. You will note that this is helped if you’ve already set the viewer’s expectations about which direction is which. 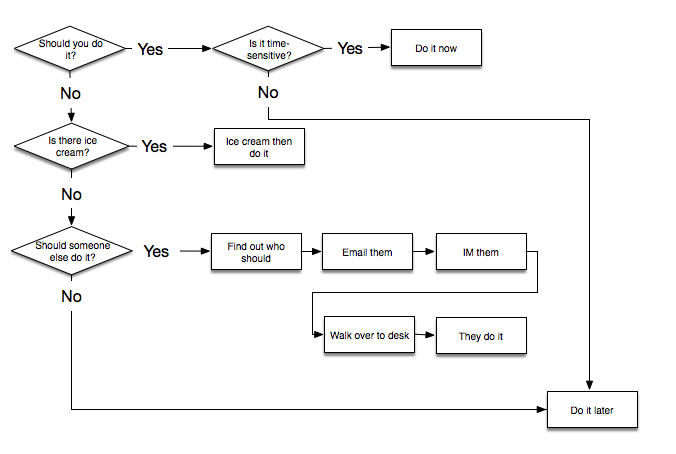 If I put both of those in front of someone and asked them to follow through the decisions, it’s now much easier to read and figure out what to do. 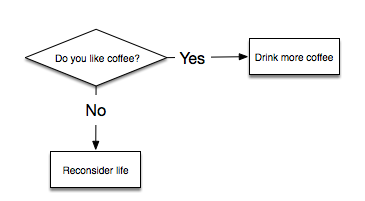 Let me know if this helped, or if there’s more simple, easy-to-apply guidelines I should include. This entry was posted in day jobs, Product Management, Work work work on May 2, 2016 by DMZ. But why would I want to work here? Exciting opportunity to be part of one of the most innovative companies of the new millennium!!! We offer a dynamic work environment that thrives on creativity, adaptability and passion. • Manage internal and external customer relationships and expectations. • Prepare timely and appropriate communications for escalations, project status reports, decisions and risk mitigation plans. • 6-8 years experience managing cross-functional teams and software development projects for technology organizations. • Experience managing custom “in-house” developed software projects and managing implementations of COTS applications required. • Bachelors Degree in business or technical field required. Easily 80% of listings look like some variation of that: requirements, duties. Companies spend so much money recruiting and training new employees, and yet the way they try to attract candidates is not to put people who already work there on it, or to even have their best employees help make the listings more attractive. It’s baffling, totally baffling. This entry was posted in day jobs on August 29, 2008 by DMZ. My PC, which has been acting pretty stable after a period of dying a lot, died today pretty thoroughly. So while contemplating (again) whether I should go order a replacement Mac or PC, I hooked up my beloved MacBook Pro… dead. Dead as Dillinger. I’m writing this while researching reasons the MacBook might not start up on my wife’s laptop and I’m deathly afraid I’ll go 3-3 today. Update: My laptop’s back up. I feel 90% less dread-filled now. That was a pretty horrible two hours though. The space key, oddly, doesn’t quite work right: the correspondence between press and result is not quite 100% which is making tough typing really annoying. But at least it boots, which is more than I can say for my other box. This entry was posted in day jobs, Uncategorized on July 27, 2008 by DMZ. Discussing a problem today, we tossed around some solutions that involved generating a lot of transactions on the back end, and I stopped and said “You know, we’re casually discussing an option that requires more computing power than existed in the world in like… 1985.” And the people I was talking to all cracked huge grins. I’m not actually sure that’s true, after trying for a while to figure out what the world’s computing power was in 1985 and how many processor instructions a web request actually generates, I believe that may not have been that far off. 1982, maybe. I should ask this as an interview question for a program manager and see what they come up with. I started out my tech career for real working on a web=based telesales application for inbound call center agents for AT&T Wireless, and we had to deal with a couple hundred people placing orders slowly, moving screen-to-screen as they talked to the customer or helped them pick an option. And while that had its own set of challenges, they aren’t remotely as cool as the ones I get at Expedia. This entry was posted in day jobs on June 10, 2008 by DMZ. Something I worked on is live, yay! Most of my software career I’ve worked on stuff I can’t show off, which is why today’s particularly fun for me. Led by Marcos Guerrero, who I fully endorse as a business customer and Elena Camerini, the senior program manager on this project, Expedia just deployed a whole new set of pages… across nearly every point of sale. I obviously shouldn’t talk about the why, but they’re live, so I’m free to link to them. Things I touched there: I wrote the spec for the filters on the left-hand side, the list of hotel results down the middle, and the map widget on the right hand side. I’m quite proud of the team. This entry was posted in day jobs on May 31, 2008 by DMZ. Two weeks in London a quarter, we’ll see how that works out. The first one may be in December. December in London! Hee hee hee. Clearly makes writing more difficult, not sure how I’m going to manage that, but uh… gotta keep the lights on at Haus Zumsteg. And my car’s latest repair bill is likely to approach its value, for the second time this year. Which is awesome. Not that I drive much, but… sigh. This entry was posted in day jobs on September 10, 2007 by DMZ. So! Picked up the car (two-week total: $1700+, over 50% the value of the car). Job 1: looped, no word yet. I couldn’t say how it went. Parts of it went quite well, others I couldn’t read. Job 2: interviewed, loop is tomorrow. They want to talk to me more, I want to talk to them more. Job 3: did an interview today, way cool, the people seem awesome, the company’s great. But there’s also no position to talk about yet specifically (I’d be doing x for y team…). Job 4: contracting jobs. I’ve got some exploratory conversations booked. Might actually work out the best if I get into Clarion, which — hey, wow, I might actually hear back from them in the next few weeks! That came up fast. So yeah, things are progressing. It’s strange to be job-hunting as the book comes out. This entry was posted in day jobs on March 29, 2007 by DMZ. So it looks like I’ll be doing two interviews this week, one with Ye Olde Expedia, and one somewhere else. The interesting thing to me is that I ranted a while back about my frustration with the on-again, off-again recruiting of a company I really wanted to work for, and how I stopped trying. Anyway, I got a note from a recruiter for a company, and I remembered that I’d talked to her as a job reference for a friend maybe six months ago, and it was a pleasant conversation and they were good about the whole thing – they called when they said they’d call, they were efficient but not forced about getting through it, and seemed as concerned about whether my friend would be happy as anything. And I don’t think I’d have an interview scheduled if I hadn’t had a previous, positive contract with them. I’ll put those next to “don’t ever, ever outsource customer support” on my business plan. But yeah, two interviews this week. This entry was posted in day jobs on March 13, 2007 by DMZ. Short version: If I don’t manage to sell the next book proposal or some stories quick, I’d probably go back to Expedia, but they’re slashing headcount and it doesn’t look like there are program manager jobs. So I’ve been keeping an eye out for other jobs. I don’t know how I feel about this, having done it, except that the chance the job is actually an amazing opportunity made it worth it. We’ll see. In the meantime, this establishes that as conflicted as I might be about wanting to get back into IT, I’m at least vulnerable to pitches. This entry was posted in day jobs on February 12, 2007 by DMZ.